​James wrote the movies Severance, Cockneys Vs Zombies, Tower Block, and episodes of internationally acclaimed TV shows such as Doctor Who, Torchwood, Spooks, Primeval, Spooks: Code 9, Crusoe, The Sparticle Mystery, Crossing Lines, and Eve. He has several more upcoming film and TV projects in development. His other work includes 5-time Streamy Award nominated web series Girl Number 9, and several short films which he wrote and directed. His first short, the award-winning hit Crazy for You (Best Horror/Sci-Fi, Crystal Palace International Film Festival), starred Arthur Darvill and Hannah Tointon, screened at huge festivals across the globe, and is now part of anthology feature film Minutes Past Midnight, and has been licensed by Shorts International for television and online use in various territories. His latest short, the multi-award-winning Blood Shed, stars Shaun Dooley (The Woman in Black, Gunpowder, Doctor Who, Misfits) and Sally Phillips (Veep, I'm Alan Partridge, Smack the Pony, the Bridget Jones movies), has played over 50 festivals around the world, including BAFTA and Oscar qualifiers such as Encounters, Seattle International Film Festival, Nashville, Underwire, Dublin International Film Festival, and many more. His hit web series, Mina Murray’s Journal won the Best Screenplay award at Dublin Web Fest 2016, and screened at HollyWeb in Los Angeles, and Vancouver Web Fest. 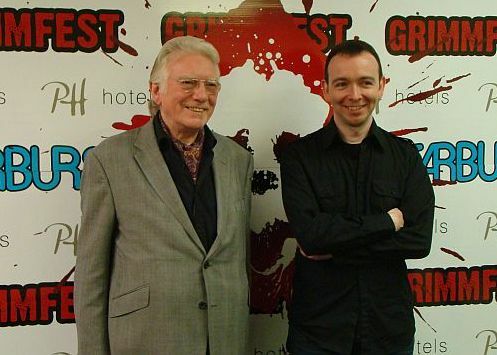 James also directed several popular Turn Off Your Bloody Phone idents for FrightFest, and contributed script work to cult hit feature film The Borderlands, released in the US as Final Prayer. He is co-director of production company Moranic Productions, with his wife, fellow filmmaker and screenwriter Cat Davies. ​He has written several articles for film & TV websites, and is a regular guest speaker at film schools, conventions, seminars and conferences around the world, doing panels, Q&As, interviews, and writing workshops. If you would like him to attend your event, contact him directly at his public email address. James is represented in the UK by Jonathan Kinnersley at The Agency, and in the US by Abram Nalibotsky at The Gersh Agency.